Snowy White Quartz crystal point with a frosting of hematite from Brazil. Beautiful snowy white Quartz crystal point with a frosting of soft hued terra cotta red colored hematite from Brazil. The energetic combination of Hematite and Quartz Crystal creates healing support and positive action coupled with an abundance of physical energy and vitality. Quartz Crystal is one of the most powerful healing and amplifier as it absorbs, stores, releases, and regulates energy. Hematoid quartz protects against radiation and generates electromagnetism and dispels static electricity. 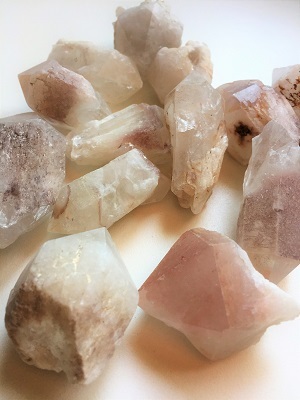 Hematoid quartz also may enhance psychic abilities and align you with your spiritual purpose. Hematite is an excellent stone for grounding and protecting, harmonizing mind, body and spirit. Hematite is a stone of integration. Hematite facilitates the path to a peaceful way of being. Hematite is helpful for those manifesting dreams into reality. Hematite dissolves negativity and prevents negative energies from entering the aura. 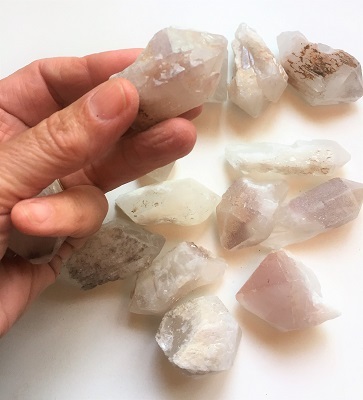 Hematoid Quartz boosts self-esteem with its energies that are calming while encouraging one to “reach for the sun.” Hematite helps one to realize the only limitations in existence are those from one’s own mind and ego. Hematite is an excellent stone for accessing the subconscious mind. Hematite enhances will power and is useful in overcoming compulsions and addictions. Hematite treats overeating, smoking or any form of over indulgence. Hematite stimulates concentration and focus, memory enhancement, and original thinking. 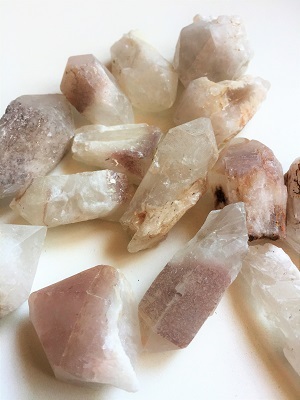 In healing, Hematoid quartz supports the kidneys in cleansing blood. Hematite helps with the regeneration of tissue. Hematite stimulates the absorption of iron and the formation of red blood cells. Hematite treats leg cramps, anxiety and insomnia, aids spinal alignment and fractures. Hematite may be useful in de-toxing and strengthening the liver. Quartz Crystal is a master healer and may be used for any condition. Quartz Crystal stimulates the immune system and brings the body into balance harmonizing all the chakras and aligns the subtle bodies.